Upper Crossed Syndrome is the name given to a particular type of muscle imbalance caused by poor posture. It can result in neck pain, cervical disk injury, headaches, upper back pain, shoulder pain, rotator cuff tendon injuries, numbness of the hands, and it can even play a role in the development of lower back pain. 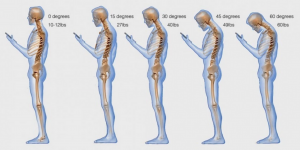 It is one of the most common postural imbalance I see in the clinic, and it is the result of spending long hours working at a computer, driving, texting, and slouching in general as the result of fatigue or poor postural awareness. 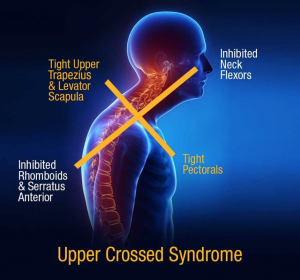 You could say that upper crossed syndrome has become a modern epidemic, and it is at the root of a lot of chronic neck and back pain. So what exactly is upper crossed syndrome, and what can you do to correct it? 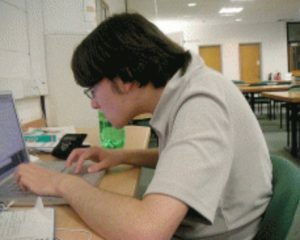 Upper crossed syndrome is the result of having a forward head, rounded shoulders, and collapsed chest posture, which you will notice all the time if you start looking at people working at a computer. Does any of this look familiar? In upper crossed syndrome, the pectoral muscles, upper trapezius, and levator scapula muscles are shortened and tight, and the rhomboids, serratus anterior, and neck flexor muscles are lengthened and inhibited. 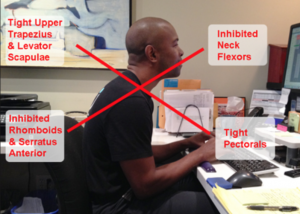 This posture can cause painful, aching or burning neck and shoulder muscles, and it can restrict blood flow to the extremities and head, resulting in numbness of the hands or headaches. It may also trigger migraines in people who are susceptible. Tight levator scapula and upper trapezius muscles can also pinch nerves that will cause a sharp pain to refer down between the shoulder blades or up into the head. This posture also restricts proper breathing, and this shallow breathing causes increased tension in the neck. Prolonged shallow breathing can also contribute to fatigue and sleepiness as the body becomes deprived of oxygen. 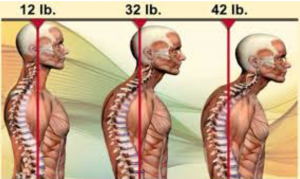 For every inch forward the head travels off the central axis of the body, it adds 10lbs of pressure on the vertebrae of the neck and upper back. As you can imagine, over time this can contribute to herniated disks, bone spurs, and other degenerative joint problems. So how do you fix upper crossed syndrome? The simple answer is to correct your posture. However, while this is a simple answer, it is not so easy for a lot of people. After many years of postural dysfunction, this muscle memory becomes imbedded in the unconscious body. Not only do certain muscles become stuck in a shortened position, but connective tissue fibers of the fascia (which is like a woven fabric that binds the muscles together in long kinetic chains) becomes knotted and tight. Fascia is dense and tough and can be challenging to stretch. As the nervous system has been holding this posture for so long, it is also difficult for the brain to locate and activate certain muscles as you try and correct your posture. It can feel as if there is a tug-of-war going on in the body, and there are dead zones of awareness and control around the muscles that have been lengthened and inhibited for so long. Although postural correction can be a challenge, there are some great tools you can use to help the process along and build greater support and awareness. The first great tool is a revolutionary system of acupuncture called Sports Medicine Acupuncture®. This system combines Western sports medicine and traditional acupuncture to help restructure the body posture and promote optimal function. It can help to reset muscle function (either relax a tight muscle or turn on an inhibited muscle), lengthen connective tissue bands, and improve mind-body awareness and control. It achieves this by stimulating specific acupuncture points called motor points, which are where the nerve fibers that tell the muscle to turn on or off enter the muscle fibers in the main belly of a muscle. These are not traditional acupuncture points (they are a modern discovery) and they are more effective than more commonly used trigger points for relieving pain, reducing muscle tension and improving function, and increasing range of motion. While motor points are a modern discovery, they can be combined with more traditional acupuncture points to enhance treatment effects. Traditional acupuncture points can help to relax connective tissue bands, calm the nervous system to reduce stress induces muscle tension, improve blood flow to heal damaged tissues, and release the body’s natural pain-killing endorphins. Following acupuncture, Sports Medicine Acupuncture® utilizes special manual therapy techniques to help further stretch the fascia so the muscles are not working against resistance. This helps to improve range of motion even further. Once tight muscles and connective tissue have been released, and weak, inhibited muscles have been activated, corrective exercises are prescribed in order to correct the posture and improve postural awareness. The corrective exercises are a vital component of treatment that is often missing from other acupuncture and pain specialty clinics. Combining Sports Medicine Acupuncture® with corrective exercises enables you to a get greater benefit that either method could produce on their own, and it is a highly effective way to relieve chronic pain and discomfort and prevent worse, degenerative injuries of the spine from occurring.